The Miskatonic London 2015 pilot semester has now wrapped, but we would like to invite all our graduates (those who were with us for the whole semester) to a screening of The Dead Eyes of London at the fantastic Masonic Temple in Liverpool Street on Saturday 4 July at 1pm (part of the East End Film Festival). This will be followed by a panel discussion on krimi films with Kim Newman, Jim Harper and Alex Fitch, after which the graduates will receive their Miskatonic diplomas from the hands of Kim Newman. The screening is ticketed for the general public (see details and ticket links for the full day’s programming at the temple below), but Miskatonic graduates have free admission with RSVP. IMPORTANT: Please email us at miskatonic.london[at]gmail.com to reserve your place. It is essential that you reserve your place by FRIDAY 26 JUNE. Congratulations to the graduates of the first Miskatonic London semester! 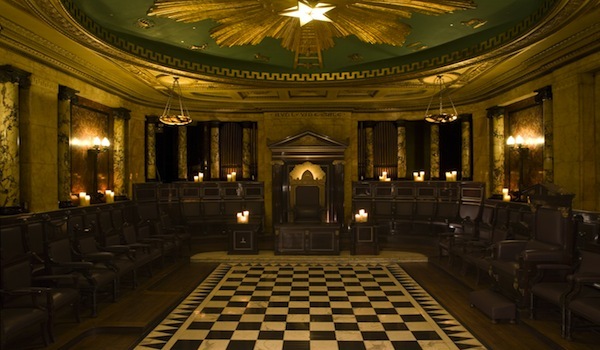 Find out more about the Masonic Temple HERE. Nothing is as it looks in this murder mystery lead by a mysterious reverend. Followed by a special talk on krimi cinema hosted by Electric Sheep’s Alex Fitch, who will be joined by author and critic Kim Newman, and author Jim Harper. This deliciously macabre setting paired with a lustrous 16mm projection make this a rare opportunity to sample this devilishly entertaining 70s thriller as a millionaire dies in a mysterious freak accident leaving his widow set to enjoy the rich spoils. Join us for a macabre night of ballroom play, immersive cinema and murder mystery masquerade featuring a screening of Favraux’s thrilling pulp-hero remake of the 1916 French film serial of the same name.